The 18-hole Arthur Hills at Boyne Highlands Resort & Country Club in Harbor Springs, MI is a resort golf course that opened in 1995. Designed by Arthur Hills, Arthur Hills at Boyne Highlands Resort & Country Club measures 7312 yards from the longest tees. The course features 6 sets of tees for different skill levels. The 18-hole Birches/Woods at Birchwood Farms Golf & Country Club in Harbor Springs, MI is a private golf course that opened in 1998. Designed by Bruce Matthews, Birches/Woods at Birchwood Farms Golf & Country Club measures 6769 yards from the longest tees. The course features 8 sets of tees for different skill levels. The 19-hole Chestnut Valley Golf Course in Harbor Springs, MI is a semi-private golf course that opened in 1994. Designed by Larry Mancour, Chestnut Valley Golf Course measures 6406 yards from the longest tees and has a slope rating of 125 and a 71. The 18-hole Farms/Birches at Birchwood Farms Golf & Country Club in Harbor Springs, MI is a private golf course that opened in 1974. Designed by Bruce Matthews, Farms/Birches at Birchwood Farms Golf & Country Club measures 6741 yards from the longest tees and has a slope rating of 137 and a 72. The 18-hole Harbor Point Golf Club in Harbor Springs, MI is a semi-private golf course that opened in 1896. Designed by David Foulis, Harbor Point Golf Club measures 5826 yards from the longest tees and has a slope rating of 123 and a 68. The 18-hole The Heather at Boyne Highlands Resort & Country Club in Harbor Springs, MI is a resort golf course that opened in 1966. Designed by Robert Trent Jones, Sr. , The Heather at Boyne Highlands Resort & Country Club measures 7154 yards from the longest tees and has a slope rating of 141 and a 74. Little Traverse Bay Golf Club is one of the courses that put the Harbor Springs area of northern Michigan on the map as one of the state's most popular golfing destinations. 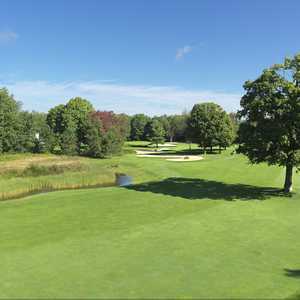 The scenic location offers panoramic views with the ability on clear days to see all the way to Little Traverse Bay on several holes. The rolling terrain provides elevated tees and green complexes that will test your skills picking the proper club. The 18-hole The Moor at Boyne Highlands Resort & Country Club in Harbor Springs, MI is a resort golf course that opened in 1974. Designed by Bill Newcomb, The Moor at Boyne Highlands Resort & Country Club measures 6850 yards from the longest tees and has a slope rating of 141 and a 73. The 18-hole Donald Ross Memorial at Boyne Highlands Resort & Country Club in Harbor Springs, MI is a resort golf course that opened in 1989. Designed by Newcomb, E. Kircher, Flick & S.
A private, gated community, True North Golf Club in Harbor Springs boasts a championship-caliber golf course by Jim Engh. The course is carved from Michigan's beloved north woods and could become known as one of the state's finest rounds. The 18-hole Wequetonsing Golf Club in Harbor Springs, MI is a private golf course that opened in 1895. 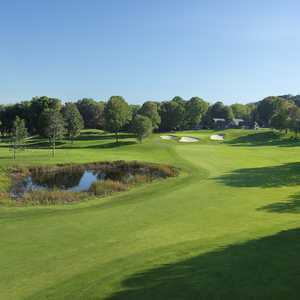 Wequetonsing Golf Club measures 5961 yards from the longest tees and has a slope rating of 126 and a 69.5 USGA rating. The course features 2 sets of tees for different skill levels. The 18-hole Woods/Farms at Birchwood Farms Golf & Country Club in Harbor Springs, MI is a private golf course that opened in 1998. 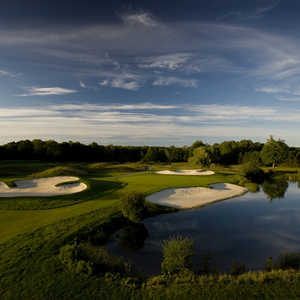 Designed by Bruce Matthews, Woods/Farms at Birchwood Farms Golf & Country Club measures 6868 yards from the longest tees. The course features 8 sets of tees for different skill levels.